Master Khan is one of Iron Fist's first enemies. He is martial artist and sorcerer who is the leader of a death cult. Master Khan often has been aided by his henchmen Scimitar. Toylab is a member of the Amazon Affiliate Program and can offer great Kung Fu merchandise deals directly from Amazon. Khan first appears in the 1960s as a trader and dabbler in the mystical arts. In one transaction a man attempts to purchase a dragon ship from Khan and he refuses. The man is a captain and he kidnaps Khan and steals the dragon boat. Khan responds by shrinking the men and boat and trapping them all in a bottle that he keeps. Master Khan was an adversary of Iron Fist early in the kung fu hero's career. Iron Fist battled to stop a death cult that sacrificed people to Master Khan. Khan was a sinister sorceror who put himself up as a god and demanded blood sacrifices from his followers. Khan brain washed Angar the Screamer to defeat Iron Fist but he was defeated. Iron Fist had many early run ins with Scimitar and the Ninja who are followers of Master Khan. In one plot Master Khan hires Constrictor and Sabretooth to steal a magic Jade Tiger for him but the plot is foiled by the Daughters of the Dragon and Heroes for Hire. Khan worked with Ward Meachum for a time giving power to the son of Iron Fist's former adversary. Khan took part in a notable story that seemed to end in Iron Fist's demise. Iron Fist had cancer and went to Kun Lun for treatment. However, in Kun Lun he was replaced by doppelganger of the plant like race the H'ylthri. The doppelganger then died which framed Luke Cage for the murder of his friend. Later, Namor stumbled upon the real Danny Rand hidden in Kun Lun. Danny Rand is freed and stumbles his away. Master Khan finds Namor but no Iron Fist and is incensed. Namor has his mind wiped by Master Khan and spends a full year wandering around the world with his memory. Finally, Namorita found Namor and his memory returned. He hunted down Master Khan and kills him by ripping off his head in revenge. There is no sign yet of Master Khan in the MCU. Ward Meachum does a appear talking to a shadowy character in the Iron Fist Trailer that could be Master Khan. 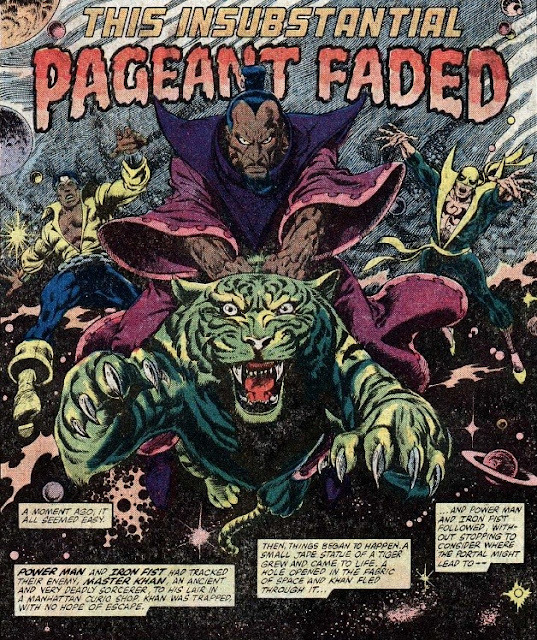 Ward did work with Master Khan for a time in the comics.